Zinny could do the lot as a rugby player. Capable of passing off either hand, and kicking off either foot, his try scoring record reflects his ball carrying ability and a fierce competitive streak. His mastery of a range of skills betrays hours of practice and a dedication to his craft. Undoubtedly there were good genes – brother Robin was capped 62 times by New Zealand while older brother Marty would probably have been an All Black if he hadn’t kicked Peter Fatialofa in the head and been blackballed earlier in his career. Nurture also played a part as Brooke père coached the boys at age grade level when work on the farm was done. Like many great players, Brooke thought his way through a game in a smarter way than the average bear and so often turned up in the right place at the right time. Early evidence of this was his selection for the 1987 RWC squad after a smattering of first class footie. Zinny had played less than ten games for Auckland and represented NZ at 7s but there was fierce competition for places in the squad. The rebel Cavaliers had toured South Africa unofficially in 1986 which proved the end of a number of international careers. That trip resulted in the ‘Baby Blacks’, where a new generation were pitched into test match rugby against a fired up French team. Consequently, there was a number of players with test match experience in contention for ’87, but Brooke’s ability to play across the back row fulfilled the selectors’ criteria for someone with the versatility required for a tournament of this nature. Although Brooke had played few times at openside, he made his debut there against Argentina and restricted the opportunities of Puma great Hugo Porta before scoring on debut. He wasn’t required for the remainder of the tournament as AJ Whetton, Michael Jones and Buck Shelford formed a classical back row and guided NZ to an inaugural RWC triumph. Watching the Kiwis dominate all other international teams, it must have seemed incredible at the time that they would have to wait 24 years for a repeat performance. Despite Zinny’s match winning ability, he’d have to wait until 1990 to get a consistent run in the side. Buck Shelford was captain of a great All Black team and his uncompromising nature appealed to hard nose coach Grizz Wyllie. While Wyllie would later pitch up at Castle Avenue to coach Clontarf as well as guiding the Pumas before Marcello Loffreda, he’d made his reputation as part of a rough, tough Canterbury pack. Shelford embodied Wyllie’s forthright demeanour on the pitch and led NZ to Bledisloe Cup wins and a victorious Northern Hemisphere tour. However, politics were at play and the urbane John Hart was Wyllie’s assistant, an appointment that paired together two characters who were at complete odds with each other. Hart had made his name at Auckland, coaching one of the greatest provincial teams the game has known. Hart didn’t have an All Black pedigree like Wyllie and without the guiding hand of Sir Brian Lochore, in charge for the 1987 RWC winning effort, the coaching team ended at loggerheads. Shelford was jettisoned and Zinny installed as number 8 with Gary Whetton taking over as captain. Auckland’s takeover of the All Blacks was complete but it wasn’t the move that the whole country wanted. Irish fans may remember the two man ‘Bring Back Beaver’ campaign lightheartedly waged in Hamilton during the third test. It had its genesis in the more full blooded ‘Bring Back Buck’ crusade waged by a large portion of the NZ rugby public during the early 90s. To no avail – Buck was deemed surplus to requirements and Zinny was the man, despite the less than full backing of his countrymen. This divide was embodied by the NZ campaign in 1991 when the All Blacks made themselves few friends. The Unsmiling Giants lost in both the PR stakes and on the pitch to Bob Dwyer’s Wallabies and it looked like the decision to jettison Shelford had backfired as a one dimensional team were put to the sword by David Campese. Zinny played some good football but Michael Jones’ absence due to his religious beliefs was compounded by the lack of cutting edge in the backline. Both John Gallagher and Matthew Ridge had signed to play rugby league in the build-up to the World Cup. Zinny had been very close to joining Ridge in making the move but changed his mind at the eleventh hour. It should be noted that by this time, Zinny had set out as a property developer. After the NZ property crash of 1987, Brooke and his brothers bought a site and a load of materials on the cheap and built themselves a big house with a room for each of the four brothers and another for all their training kit. On the back of this move into the property game, Brooke started to build himself a portfolio and as interest rates fell, his financial position improved. It has to be asked, with the benefit of hindsight, how much of Zinny’s flirtation with league was genuine and how much had to do with keeping his name in the spotlight. Zinny decided to stay in union and chose to make his money by going Italian. Michael Lynagh and David Campese were also plying their trade in the unlikely arena of Italy’s domestic championship and it was in Italy that Laurie Mains came calling, for the wrong Brooke. Mains, installed as coach in the aftermath of the 1991 debacle, made a big play going for Robin’s return to NZ while choosing to ignore Zinny. Zinny’s competitive instincts kicked in and he returned to NZ with Robin and set his sights on reclaiming his black jersey. He got his hands on it but had to share the role with Otago man Arran Pene. Pene was a straightforward powerhouse of a number eight who shared south island roots with Mains. Although Zinny had a better all round game, he would be made to work for the test spot. 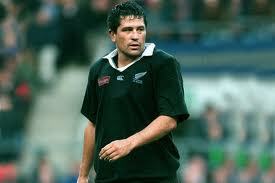 NZ, then as now, were the standard bearers of world rugby but the early nineties were a relatively vulnerable period. Their 1991 RWC campaign had been a failure and marked the emergence of Australia as a power. Rugby League still threatened to steal audience share as well as hearts and minds as the likes of Franno Botica and Vaiiga Tuigamala went north, thinning the ranks a little. NZ beat a non-vintage Lions team in the 1993 series. However, it was a controversial last minute penalty in the first test that ultimately proved the difference although NZ comprehensively won the third test, which Brooke was dropped for. The Bledisloe Cup was lost in 1992, France won two tests in NZ and England won in Twickenham in 1993. Throughout all this time, Brooke was part of a great Auckland team that held the Ranfurly Shield from 1985 to 1993, defending a record 61 challenges. The Whettons, Olo Brown, John Kirwan, Grant Fox, Terry Wright, Bernie McCahill, Sean Fitzpatrick and Zinzan Brooke backboned this team and Zinny was the leading try scorer among the forwards. Having inherited Shelford’s jersey in controversial circumstances, Brooke had to work to overtake Pene. His flirtation with league, his sojourn to Italy and a flamboyant playing style marked Brooke as talented but possibly a luxury. The 1994 test series against SA put any notions like that to bed. NZ had played against the ‘Boks in 1992 in a one off test match that welcomed South Africa back to the international fold and where Zinny scored the opening try. 1994 was the first official series the two had played since 1981, when the infamous flour bomb test was played in Auckland. A generation of players had missed out on the sport’s fiercest rivalry and the chance to claim the most prized scalp for an All Black. The ’94 South African series was teak tough. The Mole remembers watching recordings of the games. It seems alien now, but they were played in daylight rather than under floodlights as Murdoch’s TV money had yet to make its demands on the game. Brooke led from the front in that series, taking the game to the South Africans, tackling hard, playing it close in and getting involved as much as possible. If the series against SA was hard, the Bledisloe game of 1994 was played at a ferocious pace, particularly in the second half as NZ desperately tried to turn around a double digit deficit. Australia won thanks to a George Gregan tackle that knocked the ball from Jeff Wilson’s hands as he went over the line. Before that, NZ had almost worn out the Australian defence with some blistering rugby which gave an indication of what lay in store. The 1995 RWC saw the emergence of a great team. Jonah Lomu was unleashed upon the world as the All Blacks tore sides to shreds with a style of rugby that left others gasping for breath. England, winners of three Grand Slams in five years, were ripped apart as Zinny scored a monster drop kick from over 40 metres. Brooke, by now a senior member of the team, was struggling with an Achilles injury sustained only a few months before the tournament but was an integral part of Mains’ game plan. His skills, vision and competitiveness made the All Blacks irresistible in their march towards the final. The final itself was an iconic moment in the sport, and would later feature in the movie Invictus. Nelson Mandela greeted the teams wearing Springbok captain Francois Pienaar’s Springbok jersey and galvanised a crowd already at near fever pitch. Many of the All Blacks themselves were at fever pitch and allegations, never proved, of their food being poisoned in the lead up to the final seem eminently plausible. Even ‘Pinetree’ Meads succumbed, although he points his finger at dodgy milk. On top of that, a South African jumbo flew just over the stadium minutes before kick-off in what seems even more mental now, post 9/11. Destiny was on the side of the Springboks that day as the Rainbow Nation gathered behind a team that had so often proved divisive. NZ lost that game but would win their first ever test series in South Africa the following season with Zinny scoring a try and another drop goal in Loftus Versfeld to seal victory. NZ lost the dead rubber in Jo’burg and Brooke remained unbeaten in his international career. He signed off his domestic career by leading Auckland to consecutive Super 12 titles before heading to London and earning some sterling. His time with Harlequins came at a period when the multi-coloured Londoners were still sporting a streak of yellow down their back and the best time to play them was during ski season. By that stage he had done it all as a player and Brooke’s frustrations coaching can be seen in this documentary. The advent of professionalism came at the end of Zinny’s career but that hadn’t stopped him taking it as seriously as his livelihood or, indeed, making a good living out of rugby. The skills that he learned off the pitch stood well to him and Brooke is still involved in property development and media work in London. They broke the mould after casting Zinzan Valentine Brooke: a fiercely proud All Black who had high profile dalliances with rugby league and Japan; a self-confessed farm boy who toiled on building sites before making his living in Italy and with London’s most cosmopolitan club; an entrepreneur and successful business man who left school at fifteen; captain of the big city province in New Zealand and beneficiary of political turf wars who always seemed like a free spirit with no time for rugby politics. In many ways he was the prototypical professional player, teak tough and canny, with skills that allowed him to play anywhere across the park. However, it seems unlikely that an academy graduate would be afforded the opportunity to develop as many strings to his bow as the kid from Puhoi who only ever wanted to be a sheep shearer. This entry was posted in Hall of Fame and tagged drop goals, Renaissance Man, skills pay the bills, Suzie, total rugby, Zinzan Brooke by dementedmole. Bookmark the permalink. Amazin’ timing! He’s just been declared bankrupt. On ya Zinny! The Curse of the Mole strikes again! First, the Irish test team under Declan Kidney, now Zinny’s B&B. Be afraid. A worthy addition to the pantheon, DM. Zinny had huge boots to fill when he was introduced into the All Blacks side, because Buck Shelford was a force of nature. I’d say that Shelford was the greatest rugby leader I’ve ever seen – including Eales, Johnson, Smit, Fitzpatrick, O’Driscoll. They might have been better captains in terms of decision-making and influencing the referee, bit in terms of setting the standard for the team’s mentality, Shelford was the best I’ve ever seen. That he could be replaced at all was pretty amazing, and that he was pushed out of the limelight so soon is a huge compliment to Brooke. ZB was interviewed on Newstalk last year. He described how he developed his competitiveness and his kicking as a kid. They had an orchard on the farm and the brothers used to have kicking contests using various apple trees as targets when kicking from distance. I wonder if Ol’ Man Brookes knew what the nippers were up to?? ?